Look, we get it, your furry friend is family with its own individual personality, needs, desires, and routine. You can’t trust just anybody to come in and take care of your pet. You need the utmost guarantee that the person you entrust to take care of your animal cares just as much about them as you do and will make your pet feel as comfortable as they can. Here at Cane Bay Pet Sitting & More, that’s what we’re all about. 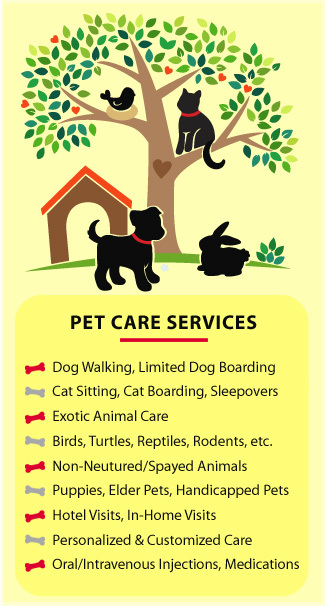 First and foremost, we’re animal lovers, yet we’re also fully insured and bonded, licensed professionals. We have both a personal love and desire to help take care of animals paired with the professional training you can trust. 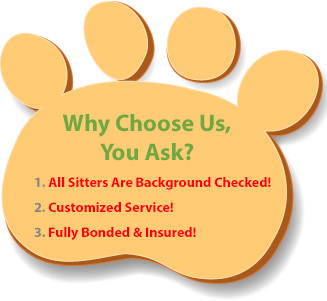 We’re not some kind of heartless kennel or boring boarding house, we treat your animal with love and respect, giving them the run of the sitter’s home or we keep your animal company in your own home. If you’re away, we’ll make sure your pet is always at play. Pets are routine-oriented and it can be psychologically damaging when that routine is broken. If your animal has breakfast at a certain time, an afternoon snack and a short fetch session, and dinner at a certain time, to throw that well-established routine into chaos can cause problems. When it comes to your pet’s routine, we make absolutely sure to stick to it while you’re away. Whether you’re going out of town for a short time, or you regularly find yourself traveling for business or pleasure, Cane Bay Pet Sitting & More will keep your information on file to ensure your pet has no break in their routine. It doesn’t matter if you’re leaving tomorrow or a month from now or if you have a tea-cup sized puppy or a full-grown Irish wolf hound, no pet sitting job is too big, too small, or too short notice for us. Call us now to make an appointment and we’ll make it work.